requires something warm or cold to drink. The table is small; I figured a coaster would never stay on the table. Voila! 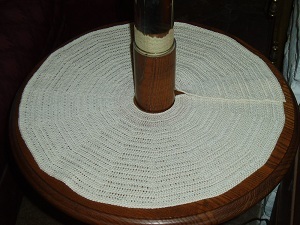 A coaster that doesn't fall off the table. My bread machine sits on top of my refrigerator. I basically started at the bottom and worked my way up. The machine is pretty much shaped like a barn. until I reached the part where the ends tapered like a roof. then continued to work in rounds, decreasing at each corner. I just slip stitched the sides together to close the top. just to open a jar. It's a rather large appliance, but it works pretty good. 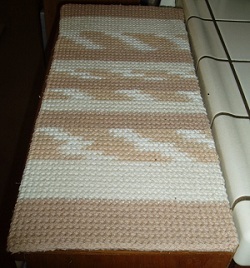 I crocheted a cover for it. I made it pretty much the same way I did the one for the bread machine. I have a small bookcase that is on the back side of a kitchen counter. Of course, it's become an extension of that counter. using and washing the top took it's toll. 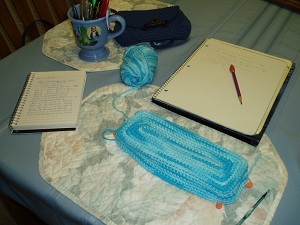 I basically made a long potholder... and it works well. 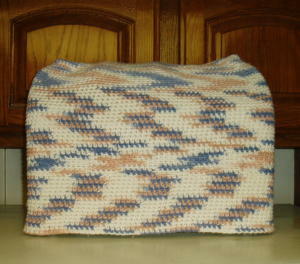 I used Helena's Potholder Stitch. 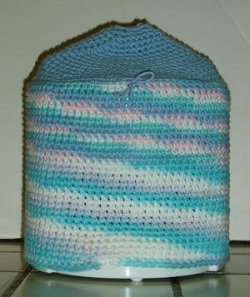 I use it for all my potholders.